Isaac Goldstein (19th century) was an American Jewish novelist. Very little is known concerning him aside that he lived in Philadelphia, Pennsylvania and in New York before returning to central Europe. In 1866, he published Jesus of Nazareth: An Authentic Ancient Tale (Yeshu ha-notsri), one of the first modern Jewish interpretations of Jesus. 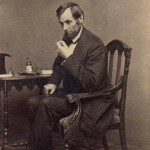 He is also known as the author of a short Hebrew poem (1865) celebrating the memory of Abraham Lincoln, which he signed Isaac Goldstein the Levite. For more, see Kabakoff, Jacob. "Isaac Goldstein - pioneer Hebrew merchant - author" in Hebrew Studies 17 (1976) p.118-125.